Fixing a dent in your car doesn’t have to be expensive. Odds are you can do it yourself without leaving the garage, provided you have the right tools. By using common household items, you can likely avoid the repair shop and save a good amount of money. 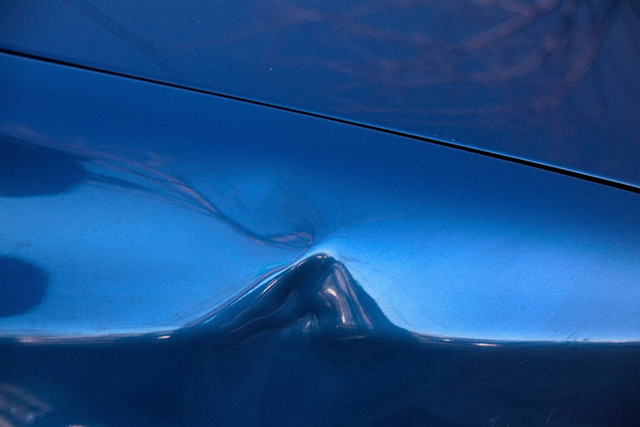 Here are a few ways to fix a car dent from us here at Haddad Nissan. Boiling Water – If you got a dent in your rear bumper, you already know the plastic isn’t very flexible. To help fix it, remove the bumper and apply hot or boiling water to the dent. The heat should make the plastic more malleable, allowing you to push the dent out. Plunger – If you have a sink plunger, called a cup plunger in stores, lying around, you already have everything to remove small and medium-sized dents. Apply water to both the plunger and the dent. Push and pull like you would on a clog. The suction should pop the dent out. Hot and Cold Air – By using a hair dryer to heat the metal then using an upside down can of compressed air to cool it, you can remove a dent without even touching it. The heat causes the metal to expand while the cold air makes it contract, effectively removing the dent.